The Capybara (Hydrochaeris hydrochaeris) is the world's largest rodent (related to rats and mice). In the absence of competition from large mammals it took up the habits of species found elsewhere. For example, the capybara occupies an equivalent niche to the hippopotamus. In fact, some fossil capybara species grew to the size of a small horse! The present-day species weighs up to 150 pounds and averages 4 feet from head to rump (it doesn't have much of a tail). Adapted to spend much of its time in water, it has eyes, ears and nostrils at the top of its head. 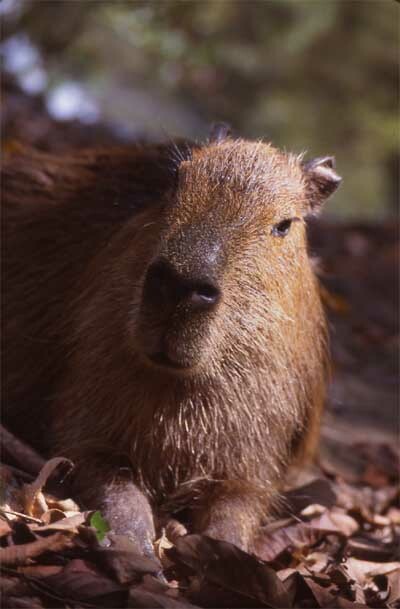 The capybara occurs throughout the Amazon, and down to northern Argentina. However, it is becoming rare around populated areas as it is widely hunted for meat.